We report the first in vitro and genetic confirmation of Malarone® (GlaxoSmithKline; atovaquone and proguanil hydrochloride) resistance in Plasmodium falciparum acquired in Africa. On presenting with malaria two weeks after returning from a 4-week visit to Lagos, Nigeria without prophylaxis, a male patient was given a standard 3-day treatment course of Malarone®. Twenty-eight days later the parasitaemia recrudesced. Parasites were cultured from the blood and the isolate (NGATV01) was shown to be resistant to atovaquone and the antifolate pyrimethamine. The cytochrome b gene of isolate NGATV01 showed a single mutation, Tyr268Asn which has not been seen previously. Increasing reports of drug-resistant P. falciparum throughout the world have forced changes in both prevention and treatment. Malarone® (GlaxoSmithKline; atovaquone and proguanil hydrochloride) is a recently introduced new drug combination for the treatment [1, 2] and prophylaxis [3, 4] of falciparum malaria. We report the first in vitro and genetic confirmation of Malarone® resistance in a case of P. falciparum acquired in Africa. A forty-five year old Nigerian male, resident in the UK, presented with a fever and 1.5% P. falciparum parasitaemia two weeks after returning from a 4-week visit to Lagos, Nigeria without taking prophylaxis. The patient was given a standard 3-day treatment course of Malarone®; four tablets daily (one tablet is equivalent to 250 mg of atovaquone and 100 mg of proguanil hydrochloride) with food which he tolerated well without vomiting and was later discharged. Twenty-eight days later, his malaria symptoms returned. After a further five days the patient was readmitted to hospital with a parasitaemia of less than 1 %. A blood sample taken at this point was placed into culture. The patient was successfully treated with quinine 600 mg three times per day for three days followed by doxycycline 100 mg per day for seven days. 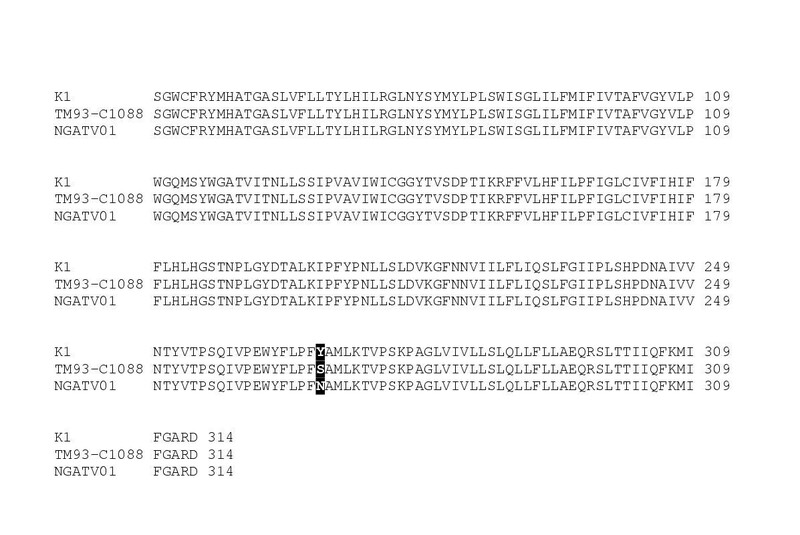 Sequence analysis of P. falciparum CYT b gene from isolate NGATV01 showing codons 70 to 309. Residue 268 highlighted shows the change from tyrosine (Y) to asparagine (N) compared to atovaquone-sensitive strain K1 and the change to serine (S) in the atovaquone-resistant strain TM93-C1088 . In vitro sensitivity of isolate NGATV01 and strain K1 to standard antimalarial drugs with standard deviations (nmol/L). The target of atovaquone, CYT b, plays an important role in electron transport during mitochondrial respiration. It is thought that the drug, an analogue of coenzyme Q (ubiquinone), interrupts electron transport and leads to loss of the mitochondrial membrane potential [7, 8]. Tyr268 is a conserved bulky hydrophobic contact of the drug in the Qo II region of the ubiquinol oxidation site. Substitution of the less bulky Asn268 should affect the fit and binding of the drug (Figure 2). Atovaquone (ATV) in P. falciparum cytochrome b active site. 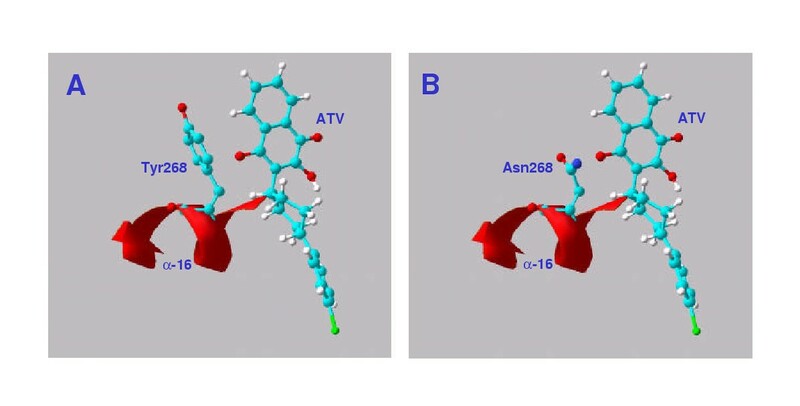 A: Atovaquone built and docked using HyperChem release 6, in the active site of a model of P. falciparum cytochrome B. Homology model prepared using the structure of the chicken enzyme  with the aid of the SWISS-MODEL Protein Modelling Server and observed in the Swiss Model Viewer . B: As A, with active site tyrosine268 replaced by asparagine. Resistance rapidly emerges when atovaquone is used alone . It has been hypothesised that the mode of action of the drug might contribute to the rapid appearance of resistant parasites. During a stage in its interaction with the site when the drug is partially oxidised, the semiquinone formed would be capable of forming reactive oxygen species (ROS) capable of acting as local mutagens during replication of the mtDNA. Proguanil is believed to speed the loss of the membrane potential, and ensure that replication of DNA stops before mutagenesis can occur . This is an unusual example of resistance detected during a single course of Malarone® on only a moderate parasitaemia. The atovaquone/proguanil combination has not been widely used yet in West Africa so it is unlikely that the patient was initially infected with an atovaquone-resistant strain. The presence of multidrug-resistant strains such as this example raises concern about the recent move to consider using Malarone as first-line therapy in Africa . The case questions the potential useful life of this combination, especially as atovaquone may persist alone in plasma for up to 6 weeks after treatment . It appears that the synergistic interaction with proguanil is not seen in atovaquone-resistant mutants , and higher resistance levels are achievable. We thank Dr. Watcharee Chokejindachai and Dr. Jill Curtis of the London School of Hygiene and Tropical Medicine for technical advice and encouragement. Quinton Fivelman was supported by the Association of Commonwealth Universities and David Warhurst thanks UK PHLS for financial support.